If you've found a rich spot that is hard to access, this hand dredge is a great tool to have on hand. Gold can hide down in the deepest part of a crack or crevice or behind a boulder and often is best reached with a hand dredge, also called a "sucker gun" or "suction gun." This gold prospecting tool is ideal for working below the water line when a motorized dredge cannot be used. • 2 gallon "Quick View" bucket and twist off "Gamma Lid"
• Extra set of valve diaphragms - it's like having two sets of valves at the ready! • Sniper Nozzle with "Rock Block" reaches into cracks and crevices. • Bulk Sand Nozzle- Designed to quickly draw sand and 1/2 inch material. 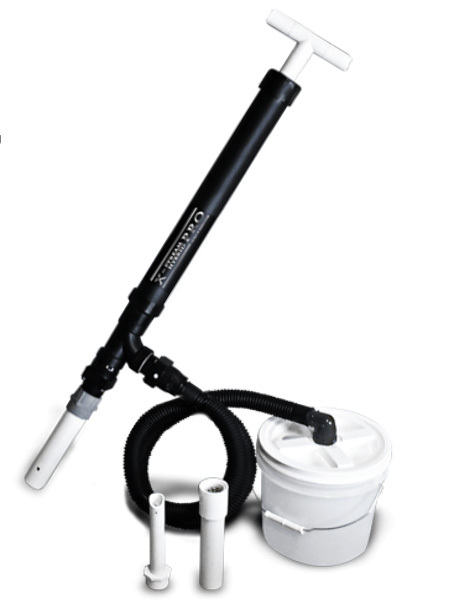 • Classifier Nozzle- filters sticks and leaves and gets just the sand #8 and smaller. Hand dredge itself is 36 inches long before attaching any nozzle; 8 inch extension is included giving you even more reach! Prefer to build this hand dredge yourself? Do-It-Yourself Hand Dredge Kit found here.